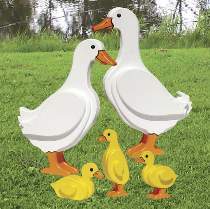 Make this duck family from 3/4" and 1-1/2" wood. Adult ducks measure 19"H. All patterns drawn FULL SIZE. Order one fiberglass rod and two black eyes for each duck separately below.